American politicians from the two main parties have finally found something to agree on: More intervention in Venezuela. This unprecedented unity between Democrats and Republicans reflects an American legacy that precedes the current Donald Trump administration by nearly two centuries. In fact, it goes much further and deeper than the US hegemonic approach to South America to encompass the entire Western political hemisphere, with the exception of Italy, Norway and Greece. Notwithstanding Maduro’s own shortcomings in uniting his people in the face of a most pressing economic crisis, what gives Trump, Canada’s Justin Trudeau or France’s Emmanuel Macron the right to cast a deciding vote on who rules over Venezuela? Sadly, Venezuela is neither the precedent, nor the exception. South America, the Middle East and Africa have for long been perceived as Western protectorates. They are all rich with oil and other essential raw materials, but are also strategically significant in terms of global hegemony. Colonialism might have ended in its traditional form (with Palestine being the main exception), but it lives on in other ways. While the US and its Western allies are strongly challenged by rising economic and military powers in Asia, the fate of South America, the Middle East and Africa is yet to be decided. The US, in particular, has always viewed South America as its own turf, and has either directly or indirectly contributed to coups and political and economic instability throughout the continent. US National Security Adviser John Bolton has garnered a terrible reputation due to his role in the invasion of Iraq and the subsequent destabilization of the Middle East. Although discredited for his thoughtless and often militant approach to politics, he was resurrected by the Trump administration and is now traveling the world sowing the seeds of political and military discord. While speaking about Washington’s need to “protect democracy” in Venezuela, Bolton admitted that a coup there would present an opportunity to exploit the country’s vast oil and natural resources. Bolton explained the economic logic of US intervention in an interview with Fox News, soon after Venezuelan opposition leader and a main ally of the US, Juan Guaido, declared himself “interim president” on Jan. 23. Regime change in Venezuela would “make a big difference to the United States economically, if we could have American oil companies invest in and produce the oil capabilities in Venezuela,” Bolton said. But how is that to be achieved? During a press conference at the White House a few days after Guaido’s declaration, Bolton “appeared to disclose confidential notes written on a yellow pad that included a plan to send US troops to Colombia” in preparation for a military intervention in Venezuela, according to the Washington Post. Hasn’t Iraq quelled Bolton’s appetite for intervention, considering that much of the Middle East now subsists in political uncertainty and unrelenting wars? And, if Bolton is yet to get the hint that the world is rapidly changing and that it behooves his country to reconsider its destructive interventionist foreign policy, why are Democrats joining in, along with the “liberal” and “socialist” European powers? This view is not meant to undermine the horrific economic conditions in Venezuela or overlook the endemic corruption in that country, which need to be understood and, if needed, criticized. But, while the Venezuelan people have every right to protest their government, demanding greater accountability and economic solutions to the crushing poverty they face, no one has the right to meddle in the affairs of Venezuela or any other sovereign country, anywhere. What gives Trump, Trudeau or Macron the right to cast a deciding vote on who rules over Venezuela? Hyperinflation and the crumbling of Venezuela’s oil industries have led to a dramatic economic downturn in recent years, with more than 10 percent of the population fleeing the country. Poor policy choices also led to the significant weakening of local production and increasing devaluation of the country’s currency. Venezuela has been a target on the American radar for many years. 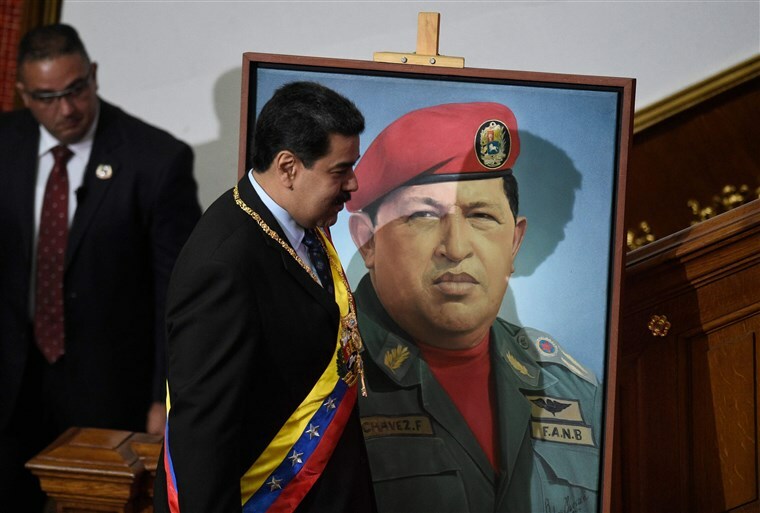 The deterioration of its economy, however, was the perfect opportunity for the US to trigger its Venezuelan allies into action, which has led to the current power struggle and political stalemate. But those counting on the US to stabilize Venezuela in the long run are ignorant of history. The US government has hardly ever been a source of stability in South America, certainly not since the Monroe Doctrine of 1823. Since then, the US has done more than mere meddling, often engaging in outright political and military interventions. Considering that all of these tragic predictions have already been witnessed in Iraq, Syria, Libya and elsewhere, South American leaders — and the few sensible voices around the world — must move to block any further US meddling and allow the people of Venezuela, through democracy, to determine their own future.